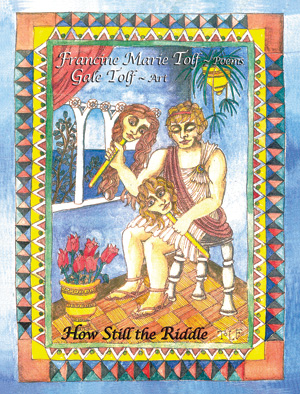 Pinyon Publishing’s newest collection of poetry and art, How Still the Riddle, contains many references to myths and fairy tales, showcasing the talents of Francine Tolf, a poet who lives and works in Minneapolis and her deceased sister, Gale Tolf. Gale’s magical illustrations might have appeared within the pages of a volume like Grimm’s Fairy Tales and complement the lyrics of an inspired poet. In the preface, the poet explains that How Still the Riddle features rhyming poems, which would have pleased her mother who “loved rhythm and sound and musicality,” and which she tried to instill in the poems of this volume. The ink and watercolor drawings by her late sister, Gale, were inspired by myth, legend, and fairytale, and are a meet companion to the rhyming poems. The artist considered Shakespeare “one of her best friends. He knew more about psychology than Freud and had a sense of humor to boot!” Her drawings often reflect her appreciation for the place of humor in memorable art. I was drawn to nature poems in the beginning of the book; e.g., “Summer Gold” where “Luxuriant and lush, late summer/mornings melt like easy gold/to full ripe afternoons, so humming-/rich a heart can barely hold/such heavy wealth./I tell myself /to savor slow the molten skies/and laden trees and dragonflies—/but never do…” And I turned a few pages to find the drawing of a magic man who appears in “Moon,” and plucks the moon from a diamond sky, then “descends into a mountain cave,/hammered it till paper thin/with magic anvil luminous—/and then he hung it back again.” Readers will discover that many of the poems and drawings appeal to children, as well as adults and that they create the same kind of mystery indicative of the Grimm tales. I was intrigued by a poem with no accompanying drawing entitled “The Island of Discussion” bearing an explanatory note that this is an island in Scotland where, in the past, those with arguments traveled to sort out their problems. “They say time on this mossy-green island/heals grudges and mends cruel wounds./It might be the meadows, it might be the mist,/but sworn enemies leave its shore friends.” Francine invites readers to sail there and “unpack ancient grievances while sipping good whiskey and sweet honey cake under fir trees in lake-scented air” —an idyllic idea that takes place on an idyllic island and would that readers could make such a voyage to resolve contemporary world problems! Poets will appreciate Francine Tolf’s tribute to poetry in “Sing Me A Poem” in which she issues the invitation to “unriddle the riddles and after you’ve mended/the tattered illusions and patches and shreds,/weave me a tapestry braided and blended/ and woven from poetry’s magical threads.” The poem is accompanied by a drawing of a wizard singing a poem to a woman holding a hand to her forehead while trying to untangle enigmas. 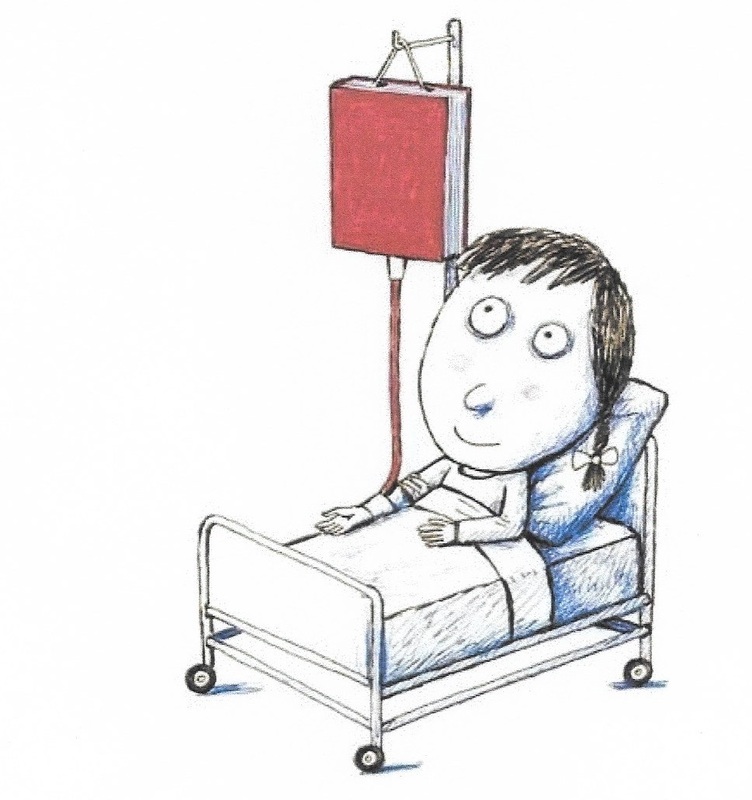 Unexpected images and a rhyming poem with emotional color will appeal largely to the adult reader, but young readers might enjoy the illustration in this tribute as much as poetry-loving adults will appreciate the contents. Francine Tolf’s work has appeared in Southern Humanities Review, Poetry East, Contrary Magazine, Rattle, and Water-Stone Review. She has received grants from the Minnesota State Arts Board and the Elizabeth George and Barbara Deming Foundations. Gale Tolf (now deceased) was an award-winning artist, writer, and teacher with a Masters degree in Gifted Education. 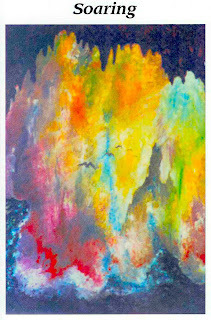 Her art was exhibited in Mandala Gallery, Pacific Grove, CA; Carl Cherry Foundation, Carmel, CA; Northeastern Illinois University; the Pacific Grove Museum; Monterey Public Library; and many other venues. How Still the Riddle is another handsome volume produced by Pinyon Publishing, a premier publisher of art and poetry with offices based in a log cabin on the Uncompahgre Plateau near Montrose, Colorado. Order from Pinyon Publishing, 23847 V66 Trail, Montrose, CO 81403. Peace and Joy to readers all. Aboard a flight from Los Angeles, California to Houston, Texas, I sat next to a young woman who appeared to be asleep for the first few laps of the trip, a woman who looked to be of Hispanic background about 25 years old. She didn’t seem anxious to talk; however, when I volunteered to pass a glass of water the stewardess thrust at occupants on our row, the young woman smiled and looked open for conversation. We quickly passed through introductions. I discovered her name was Robinette Ramirez, and her parents were natives of El Salvador now living in the San Fernando Valley. Robin teaches kindergarten in a charter school in this district, and most of her students are underperforming children from women’s homeless shelters. They are among 100,000 children in the U.S. living in homeless shelters who face a formidable statistic: two-thirds of students in the U.S. who are unable to read successfully by the end of 4th grade will end up in jail or on welfare. An even worse statistic: one in four children in America grow up without learning how to read, and 90 percent of high school drop-outs are on welfare. Robin had begun majoring in Sports Medicine in college but switched to Education and Child Development where she quickly found that her passion involved helping children become successful in school. When she told me about her experiences as a soccer player early on, it became evident to me that she had developed her poise from having a strong family life, engaging in sports, and traveling with a team worldwide. In fact, I recognized that she had the humility of a team player and knew something about servant leadership. She spoke Spanish but said she scheduled Castilian Spanish so that she could learn to speak the language correctly and scheduled English for the same reason. Robin said that most of the students in her class were part of Afro-American and Hispanic families living in the homeless shelters, children who had no real privacy and whose needs were frequently ignored. Empathy is often an unknown quality of the students’ parents, and many of the children develop the idea that they will never achieve or be successful in jobs and social situations. 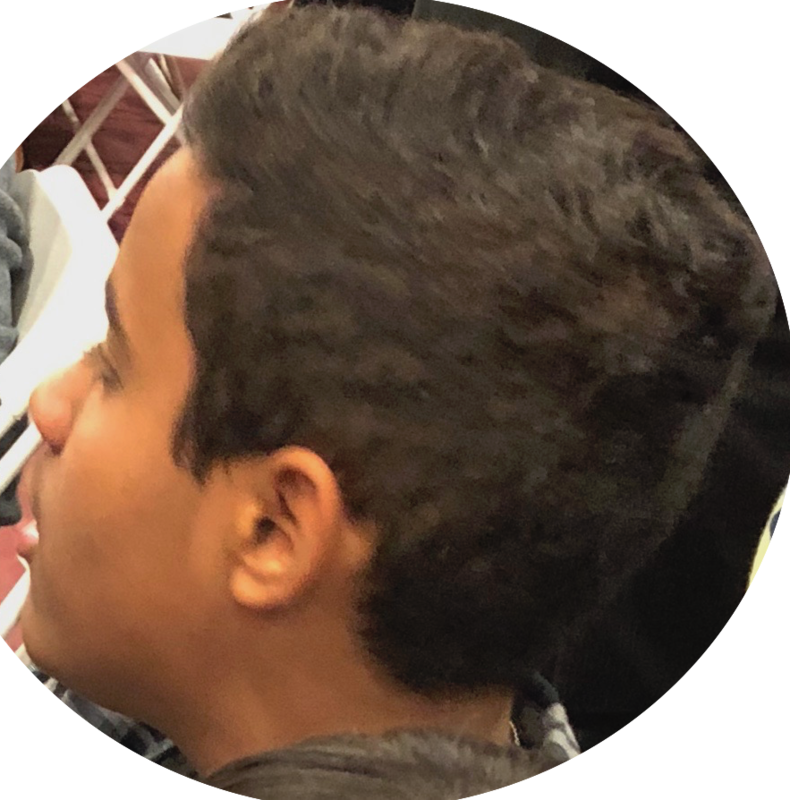 As Robin was en route to El Salvador to visit relatives during the holidays, we parted in Houston, but she shook my hand and strode off, a young warrior with a mission. She was determined to help homeless children build confidence by becoming literate so they could one day be among healthy achievers — and feel good about their lives. 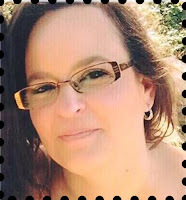 In a preceding blog, I wrote about plans to fly out to California to see my younger daughter Elizabeth, 52, receive her RN pin from Antelope Valley College, and I’m now in the desert country of Palmdale, California, a few days past the graduation ceremony. The night before my departure, fires raged in southern California and snow began to fall in southwest Louisiana! During the early hours of December 8, I began making frantic calls to the airport, to a motel in southern California, and to the California Highway Department, to see if Interstate 405, a major artery leading out of the airport, was open. The preceding day wildfires had edged the city of Los Angeles, causing this highway to close. “The 405,” as native Californians call it, connects to Hwy. 14 and Antelope Valley and a closure could have meant being stranded at LAX. Despite the uncertainty about the wildfires and falling snow, we decided to wing it. “Wing it” involved a delay at the Lafayette airport because the plane from Houston had to be de-iced; and upon arrival in Lafayette had to be de-iced again. You guessed it — we missed our connection. We sat in the Houston airport until 6 p.m., climbed aboard a United Air flight to LAX, and finally arrived at our motel in Palmdale at midnight, Louisiana time. I’m beginning to realize that I’m no longer a happy air traveler. However, Elizabeth now has her nurse’s cap, the fires have moved to other points in southern California, and we’ve begun to explore plant life, searching for several trees that will be included in my forthcoming book of poetry entitled Let the Trees Answer. 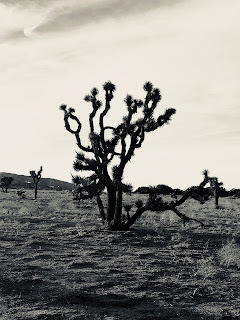 The biggest find is that of ancient Joshua trees, and my grandson Joel photographed one for me to include in the book. We also visited Prime Desert Woodland Preserve, Lancaster, CA, 100 acres of untouched high desert, with two miles of hiking trails that showcase a diversity of desert plant and animal life. 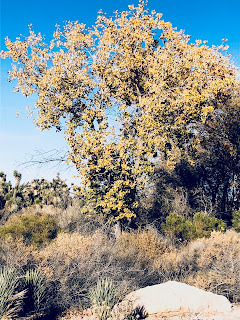 We were able to get shots of the Western Cottonwood tree to accompany one of my poems. 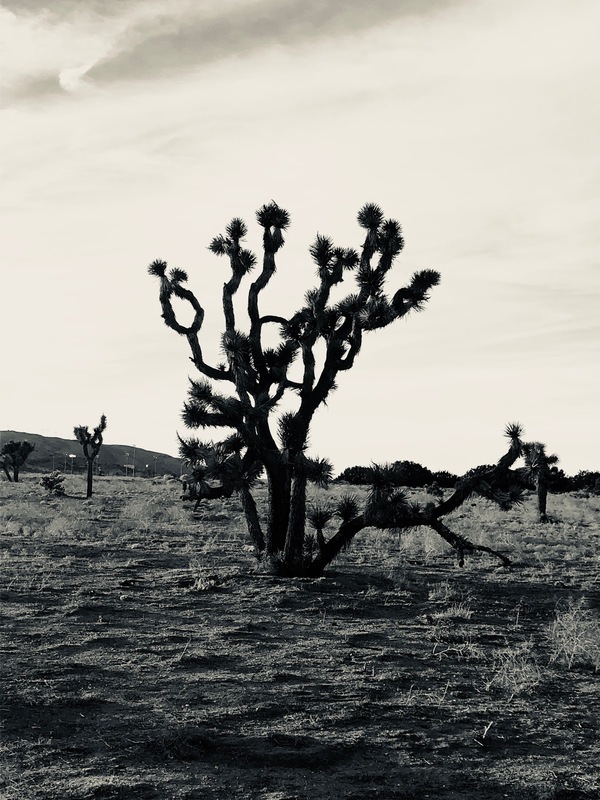 The site had a plethora of desert plant life, and we trekked the dusty trails long enough to photograph all the trees I’d hoped to find while visiting southern California. Grandson Joel, 14, loves to take photographs, and I’ve included several of his subjects in this blog to encourage his interest. Joel was diagnosed with juvenile rheumatoid arthritis shortly after he visited me in Tennessee when he was seven, but he’s a cheerful trouper — plays basketball, swims, is an active member of a church youth group, is teaching himself to play a guitar using an “app,” attends “Elizabeth’s Home School,” and is a whiz with electronic equipment. He also spends time teaching Zeke, his African gray parrot, to talk; however, Zeke only talks when we try to watch a movie or television show. According to an article written by Xi Lin in the Department of Educational Foundation Leadership and Technology at Auburn, Alabama, 61 percent of the adult student population enrolled in colleges and universities of the U.S. are female nontraditional students. They are the fastest growing segment of all groups in higher education. Most of these students have multiple roles as parents, spouses, and employees and are challenged by child care, financial, and school responsibilities. They sometimes feel marginalized and excluded from traditional campus life, and they run a formidable race to achieve their educational goals. I read this article only yesterday, and I know the facts presented in it on a firsthand basis. I know those facts because my youngest daughter, Elizabeth, at age 52, will be capped as an RN at Antelope Valley College in California (the college that former Poet Laureate Kay Ryan first entered) next week. She entered at the level of a freshman, and at the entry level, I think she underestimated her ability to succeed. However, she’s a highly-determined young woman. Her great-grandmother, Sarah Nell Greenlaw, once said that “she’s a stubborn child, but that isn’t always a bad quality.” Elizabeth was two when Grandmother Nell voiced this declaration. Elizabeth went out to California at 18 and married before she could begin her academic experience. She has three children, ranging from age 14 to 34, and she home-schooled (and still home schools the youngest) all three, two of whom graduated from the school I playfully refer to as “Elizabeth’s School.” A few years ago, she decided that the time had come for her to continue her own education, and she entered Antelope Valley College. During her years of attending college, much of the time in Honors classes, she has been a homemaker, continued to run her home school, managed the stress associated with her youngest child’s juvenile rheumatoid arthritis, and dealt with other family illnesses. I watched Elizabeth “ace” Chemistry, and Anatomy, and marveled at her ability to excel in classes for which she had no background education. She says that one of her most difficult classes was an Art History class, mostly because she had to visit museums for six weeks, several as far away as Los Angeles, which is a two-hour drive from her home in Palmdale, California.